Enjoy the scenic beauty of the Adirondack Park's mountains, lakes, wildlife, and iconic locations while playing your favorite card game! Premium quality playing cards featuring images from award-winning photographer Carl Heilman II. 54 different images - Made in the USA. 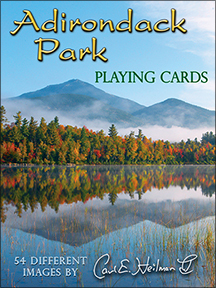 Playing cards available with Adirondack Park or Lake George specific images.